Just wanted to let ya know that I added two exciting new features to Four Tines recently! The first addition (circled in pink at the top) is Four Tines new favorite icon -- a little fork and a napkin behind it, so you won't see that tiny orange B (the Blogger logo) next to Four Tines anymore! 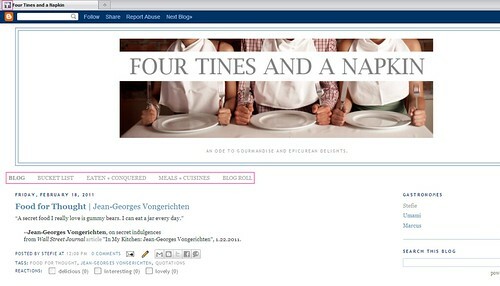 The second addition is a new navigation bar underneath the header, linking to new pages I've added: one detailing my most recent culinary bucket list, the next detailing the places I've eaten at and blogged about on Four Tines, another detailing a break out of the types meals and cuisines I've shared with you on my blog, and the last is just a list of the food blogs I find interesting and read on a daily basis. Hopefully these new additions make navigating around Four Tines much easier! Regular posts will be returning this weekend (hopefully! ), so keep your eyes peeled!